Ramirez also brings with him a commitment to engage students in study of the growing impact of Latino immigrants on the American electoral process. Although his appointment does not begin until July 2011, he began teaching at Notre Dame this fall as a visiting associate professor. His current projects include field experiments on the effects of elite mobilization efforts of Latino voters and on the role of gender and ethnicity on career paths in state legislatures since 1990. 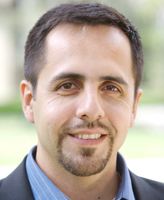 Next semester, Ramirez will teach courses on Latinos and the U.S. Political System and Race, Ethnicity, and American Politics. Ramirez, who will also be involved with the University’s Institute for Latino Studies, says the faculty is what drew him to Notre Dame. Co-editor with T. Lee and K. Ramakrishnan of Transforming Politics, Transforming America: The Political and Civic Incorporation of Immigrants in the United States and author of many other articles, Ramirez completed a B.A. at the University of California, Los Angeles, and received his M.A. and Ph.D. at Stanford University. The Rooney Center, which examines politics and policy making in the United States, hosts conferences on themes related to American politics, assists graduate students who work in the field, and supports the University’s Washington Program, which allows undergraduates to spend a semester interning in the nation’s capital. Originally published by Mark Shuman at al.nd.edu on February 10, 2011.